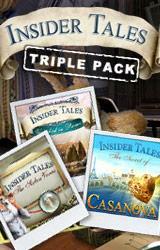 Accompany Francesca di Porta as she solves three mysteries. In The Stolen Venus, help track down the thief of Botticelli's masterpiece, The Birth of Venus. In Vanished in Rome, learn what Leonardo da Vinci has to do with a missing family from Rome. And finally, in The Secret of Casanova, reveal the mystery behind the world's most famous lover. Enjoy more than 10 hours of gameplay with a fascinating mix of crime investigation, love and mystery. 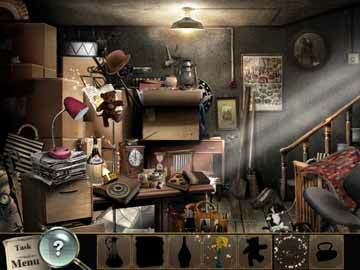 Search through countless beautiful hidden objects scenes and solve tricky riddles. Get swept away by authentic places in wonderful cities such as Paris, Rome, Venice, Vienna and Prague. It's a tantalizing treat for all. This one is a hard nut to crack as we are dealing with a triple pack that starts very humbly and expands its features and advantages from one sequel to another. So let’s start logically from the beginning and then make it to the end. 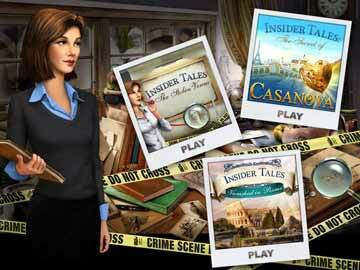 In this case it is the first and the original game Insider Tales – The Stolen Venus, but we will work our way through mentioned games, their features, what is improved compared to its previous release, etc… Stolen Venus, Vanished in Rome and The Secret of Casanova is all lead by one character, and that is Francesca Di Porta. Your first assignment in the role of detective is to find a missing artifact, Botticelli painting "Birth of Venus", which is stolen and must be recovered and brought back to its rightful place. The place where all the first leads of investigation lead to is a little place called Castiglionbasso. Upon arriving there you will start your investigation all over this small town, including the village, the local shop, the pier and in one moment the police station, all with the intention in finding clues you need to solve this case. Doing this is put very simple and you do it by selecting the place on the map where you want to go. Through the story a man called Pietro Abinoni who is an art expert. At the beginning of the game he was to one who showed you where to start looking, and then you will meet him in that little town in the prison cell, because he was steeling food. The story is full with different twists and events that will change the flow of the story in a much more unexpected direction. This feature will be the main characteristic of the third part, but that’s for later… When it comes to the search for hidden objects, there are two ways of searching, which are quite familiar to every player of casual games, through a list and combining items. The combination tile searches are quite more impressing then the ones of simple items search. This is very noticeable when you start finding identical piles of books or similar places which lose their charms after the few first couple of times of searching through them. The game also uses mostly European terminology when it comes to explaining and searching for items through the game. In certain circumstances for the Americans or people who know American English this would represent a problem, but the number of games that have went through any regular players hands are more than enough to be acquainted with the terminology of both European and American English. The problem emerges when the items that need to be found aren’t matching up with the word or words through which they are explained. However, that problem is resolved a bit through the helping system. When you hold the cursor on the item you are searching for, a silhouette appears and you get a clue to what you need to find, besides the probably misspelled words of explanation. Besides this you have the hint system on your disposal to be there for you if you still cannot find the item you are searching for. Putting all of this together you pretty much get a game done with some simple standard, with nothing to make it stand out at least a bit. But there is one thing that made it enough exceptional to stand out and that thing is the mini-games that are available in the game. They come in all shapes and sizes, from puzzles to skill challenges, and are so pleasingly varied that you never know what to expect. You'll arrange chocolates so that they fit together in a box, reassemble pictures a la jigsaw puzzle, snap photographs of fast-moving butterflies, spot the differences between images, rearrange boxes to slide a wine bottle out of storage, and even remember ever-changing sequences of flashing stars in the sky. The is the first in this triple pack and is the one with the most mistakes and bugs that you will encounter, but let’s see what the next part has to offer. Insider Tales: Vanished in Rome is a game put together from a whole different story with nothing that connects her to the previous part besides the fact it is a sequel, same headline and same main character. The game is put together for one purpose only, and that is the make sure you will forget that the previous part of this game ever existed, because of the same content the game offers but retouched making it or at last trying to make it better than before. Luca and Gia Poverelli are the winners of the lotto, to be exact a big amount of money that can only be won through a jackpot, but suddenly they disappeared… This wouldn’t be strange if they have collected the money and then disappeared, but they didn’t and that is where Francesca Di Porta (you) comes in to play again. Putting it simple it is your duty to find out what happened to the (un)lucky couple and to bring them back through different puzzles and mini-games that you need to face and solve if you want to be successful in your quest. What is the most surprising about the game is you won’t go around Rome’s Coliseum or other historical and touristic places. The beautifully drawn graphics is taking you through the everyday life of a normal Italian in his capital city. You will be walking through the streets of Rome and searching for any clues that will help you in your investigation. 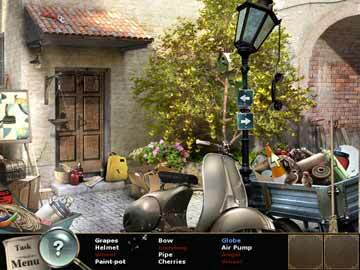 As you investigate the scenes, you'll hunt for hidden objects in different ways. You'll work with a list, look at outlines, find a bunch of similar objects, compare two scenes for differences, put objects back where they belong and snap photos to match the given black and white photos. Some scenes are scrollable in and out or side to side, but not many. This brings more life to the game as in the last previous part you could only look for the items from a list and combination of items. The hint system is still there; still the same with the rechargeable hints only a click away on the magnifying glass. The mini-games, like the seek-and-find, are similar to the ones you've seen before in other games. The instructions are short and simple, appearing at the bottom of every mini-game. In the traffic mini-game, for example, you must move objects until you can free one particular object. There are also other mini-games there like Simon and Pipes and in this part they represent even greater pleasure to play than in the previous part. The gameplay is enhanced in many ways, but still it needs polishing and it is not in a small measure… The repetition in the gameplay exists, but not in the standard way, but more in a backtracking way. You will be revisiting the same places again but from different reasons and different tasks. On more than one occasion, you need to find an item of which there are multiples in the scene. For example, you need to find a bird in a scene that contains four birds: two animated and two not. There are other items that are seen and used throughout our lives but still you will have multiple options from which you need to find out which is the right one, as it can be used on other places or at least you think it can be used. Like I said in the beginning of the second part of the review, the game is better and many of the bugs from the previous part were removed, but that doesn’t mean new ones haven’t appeared. A lot of players will definitely notice most of the bugs like during the dialogues between characters the lips will keep on moving, while there is no text that is spoken. There are others, maybe not so noticeable, but still they are there. The repetition value of the game is very low as the items that are found in the first place, will be still there where you found them the last time. If it wasn’t for the mini-games, the game would be probably too short and not attractive enough because even though the old mistakes are repaired there are new ones. And this brings us to the jewel of the package: Insider Tales: The Secret of Casanova. Francesca Di Porta is at last on a well-deserved vacation as you will notice after playing the previous two games, but like many great detectives even holidays which are very rare for them, mostly become an improvised case that need to be solved. The game is made for fun, different challenges and lots of content to keep you on your toes. Players step into the shoes of Francesca Di Porta again, a woman on vacation who is contacted by a professor friend in Italy who has stumbled across a relic once owned by the famous lover and adventurer Casanova. A heart shaped amulet is at stake and must be found as the relic that Casanova made for whom he was in the history. The levels in the game are done very proficiently as the point of every levels is to find the piece of the amulet, however a level doesn’t have to end in that exact point as additional tasks are added through to every level in which you must solve different puzzles find additional items , etc… The thing that every player will definitely will be pleased to hear is that there is no repetition or backtracking whatsoever. Every scene in the game is almost special for itself, but the magnitude of the puzzles is certainly one of the finest you won’t see everywhere. For example, one of the best examples of how the process works is a scene set in an antique observatory. It begins with players doing a bit of cursory exploring, looking for clues as to what Casanova might have been up to in the room long ago. We hunt for items appropriate to the scene, including a map describing a constellation, telescope lenses, and a microscope. Combining the ancient mysteries with the mini-games created a door for some excellent puzzles. Some of them will surely go beyond your expectations, and the improvement on already very nicely done mini-games from the previous part is noticeable. The combination of dirty windows that are still intact from the Casanova’s age and combination with some items that are still lying around reveals you some historical ‘new’ facts which weren’t known up until then. And this is only a small part of a great picture that is constantly changed as you won’t be able to predict what is going in your way and what form will a mini-game take. The search for the hidden items will surely be your greatest obstacle, as the items are very well hidden and not in a form too big or microscopic small. You will be looking for some items that are so well blended in with other similar items and you will know it is there but still even knowing you are looking at it, you will have to concentrate very hard to figure out which one do you need. But when you do get in a tight spot the hint system is still the same and always there, but you need to wait until it recharges and in certain situations it can last forever. The logic puzzles can be tricky as well, though if they remain unsolved after a couple of minute’s players have the option of simply skipping them. The game is better than its predecessors with better content, more fun challenges and more exciting puzzles to keep you alive. This triple pack is a triple danger for any player of being caught in a web of games which begin very standard and evolving from game to become something from satisfying to extremely challenging for any veteran of the HOG genre. Enjoyment is guaranteed, it is up to you just to confirm it.